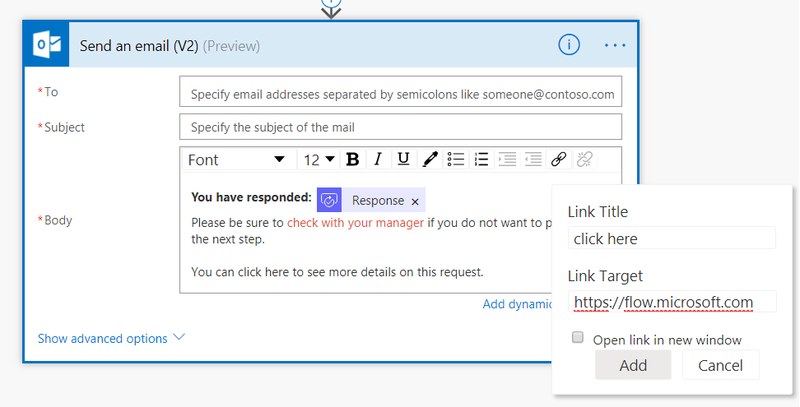 Microsoft Flow users can now use the rich text editor to draft and send HTML-based emails using office 365 Outlook and Outlook.com connectors. The rich text editor allows Flow users to change the font color, underline text, create hyperlinks, make lists, and change the font type to bold or italic. The tech giant ensured that it would add more capabilities to the text editor such as the ability to create tables. Currently, the feature is limited to Office 365 Outlook and Outlook.com connectors. Microsoft is planning to add it to more connectors in the days ahead. Very soon, Flow users will be able to use the rich text editor to create pages in OneNote, send messages in Teams, and even post articles on a WordPress website. Microsoft added four new connectors to Flow. They are Imprezian360 (sales management), Encodian (document management), Soft1 (ERP), and Zahara (purchase management). Flow is a productivity app that lets anyone create automated workflows between their frequently used applications and services, thus avoiding the need to do repetitive tasks. For example, Flow enables its users to save their Outlook email attachments directly to OneDrive. Flow is available as an integral part of following Microsoft services. Microsoft Flow is also available as an independent service for anyone who doesn’t need Office 365 or Dynamic 365 subscription. It comes in three plans, Free, Flow Plan 1 ($5/month), and Flow Plan 2 ($10).